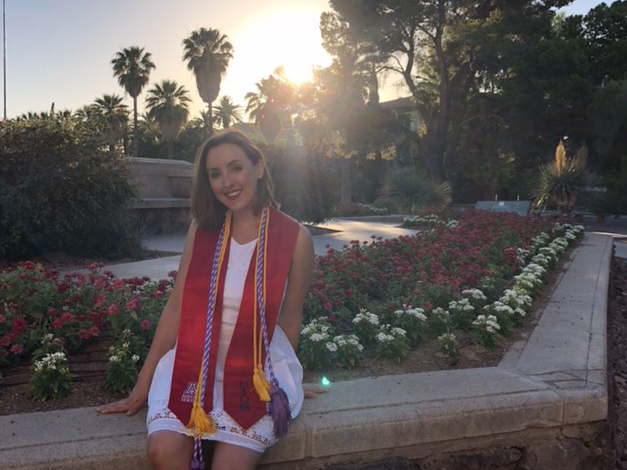 I started off studying translation and interpretation at the University of Arizona, where I earned a bachelor’s degree in Spanish and Interpretation. As part of those studies, medical interpretation was a subject matter that I found really interesting. It inspired me to move into a more hands-on career than translation and interpretation, where you are less involved in patient care. I began taking pre-nursing and volunteering at a free clinic on the Southside called Clinica Amistad, because it’s important for me to help people who aren’t proficient in English get better access to the health care system. I fell in love and decided I didn’t want to do anything else. I’m from Tucson, so I was really into the idea of staying here. This is my home and I love this city. Additionally, the UA College of Nursing has an excellent reputation with very high rankings. It has a stellar NCLEX passage rate, and the employment rate six months after graduation is around 98%. I already have a job offer from St. Mary’s Hospital that I accepted in June. Nursing’s really special because there are a lot of cool things you can study. Where else can you go to school and see a baby born or view an open-heart surgery? As a nursing student at the UA, you get these wonderful once-in-a-lifetime opportunities. Even as a professional nurse, you’ll have to specialize and you won’t be able to experience all these different kinds of things in your career. What faculty particularly made an impression on you? Patricia Wilger is my favorite faculty member. She was my instructor for med-surg and behavioral health, which is her specialty. Behavioral Health requires a lot of empathy. Not only does she have a huge capacity for love, but she’s also very knowledgeable, supportive and understanding. She really made a big difference for me. Darese Taylor, my faculty mentor, is another great instructor. She’s a NICU nurse who does a lot of the BNP lectures, which are always so much fun. Can you share a favorite memory from your time at the College of Nursing? There was a day when I was scheduled to go into the Operating Room at the VA when I had one of those ‘Wow, being a nursing student is so cool’ moments. Typically, it’s a boring shift because they don’t have a whole lot of traffic, so I wasn’t expecting much, but that was the day I saw an open-heart surgery. I witnessed an aortic valve replacement. The patient’s heart was beating right in front of me. They stopped his heart, put him on bypass, and started it back up again. It’s amazing what you do in health care. It’s just one of those things that not a lot of people get to see in their lives. I want to work as an RN for at least five years. Eventually, I really want to apply to the DNP program and become a Family Nurse Practitioner. As an RN in a patient setting, where you’re mostly treating disease as it has already progressed, I think I’d eventually like to move into primary care to prevent disease from happening in the first place. That’s my ultimate goal, I think.